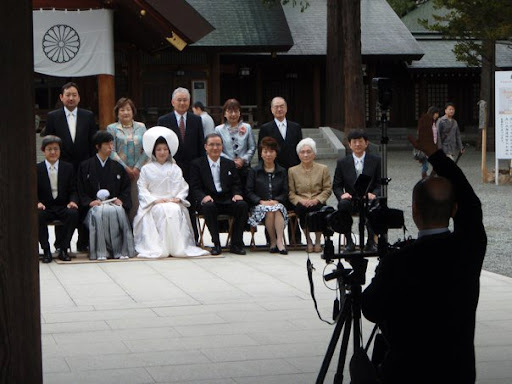 It was amazingly lucky that we had chosen to visit the Hokkaido Jingu Shinto Shrine just as a wedding was taking place. Seated just inside the shrine itself, the bride and groom were being photographed with their close family. I hesitated before taking a picture, not wanting to invade the scene, but since other visitors had no such scruples I tacked on behind them. One of the major shrines in Sapporo, the Hokkaido Jingu was established on September 1, 1869 by decree of the Meiji Emperor. It is set in a large park which, while not at its most attractive while winter was only reluctantly releasing its grip before spring, was lovely to walk through away from the main city streets. There were several small shrines around the grounds but the wedding was held at the main site. Like with most western weddings, the bride was dressed in white, but she wore a large semi-circular hat that dropped down over her ears and almost entirely obscured her dark hair. I assumed it was an alternative to a veil, but in fact I was wrong. "It's to cover her horns." I was told matter of factly. ".... horns?" Was this another part of the traditional wedding dress for Shinto services? If so, I was sorry that the hat had to hide such .... unique .... adornments. "When they were going out," my friend gestured at the married couple. "Everything was nice between them. But now the woman is a wife, she will become like a demon and will grow horns." Well, there you have it. There is a refreshingly honest look at marriage in Japan that even the ceremony traditions embrace.